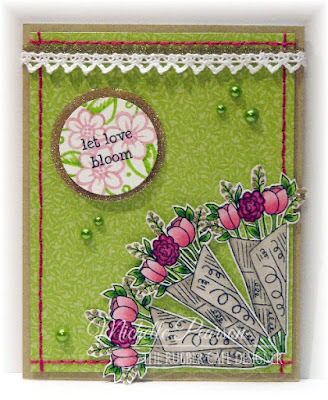 The Rubber Cafe Design Team Blog: Let Love Bloom! Oooh, I am just loving the Farm Fresh Creative Cafe Kit from The Rubber Cafe! I love the bouquet image and just had to color this one first! 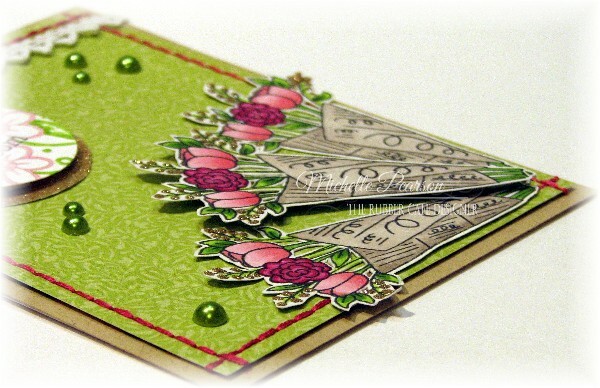 Oh, and why not color several right away....and then fussy cut them out! I did a bit of paper embroidery around the 4 x 5 1/4 inch piece of designer paper because I love the texture and interest it brings to the card, but you could doodle or add faux stitching if that is more your thing. I popped the center bouquet up on foam tape for a bit of added dimension and added some of the glitter in the kit to the sprays in each bouquet. I added a strip of 1/4 inch double stick tape along the top of the card and covered it in glitter and then offset the lace on it for a fun layered effect. I stamped the floral image in Pumice Stone Distress Ink and then traced the flowers and leaves with Copic Markers. I punched a 1 1/2 inch circle and stamped the sentiment in the center. I punched a 1 3/4 inch circle of double stick tape and covered it in glitter. My sentiment is popped up in the center with foam tape. 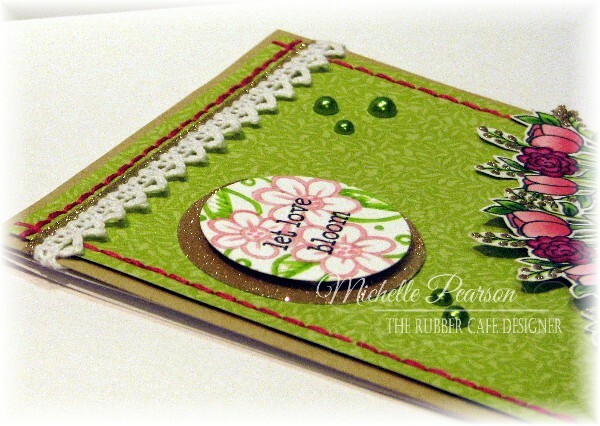 Love the sprinkling of Shamrock Green Pearls that finish off the card.